Sometimes, despite our inclination to complicate things, football is not complicated. We want to talk about strategy and tactics and ideas. We want to point at the men who make decisions on the sidelines or in the executive boxes. We want answers for whoever decided that this plan was a good plan. But, sometimes, like Sunday, it isn't complicated. It is a matter of players just catching a football that is thrown at them. It is a matter of one man tackling another when given the opportunity. Or, one man just being faster than the man asked to defend him. The higher powers in a football organization assemble the best talent for days like this, and sometimes the best talent that you have was not good enough to leave with a victory. In other words, you guys got beat. And any effort to make it bigger than that, absolves highly-compensated and highly-celebrated athletes of their only real job. When the moment comes, the team is counting on you to make a play. And on Sunday, in San Diego, the Cowboys lost because the players that they deployed to handle a Chargers side, that was certainly not highly regarded across the league, simply did not do their jobs. Certainly, blaming the players does not satisfy the enjoyable urge to put everything on the two most popular targets for Cowboys' anger - the coach and the owner. In both cases, they have earned and received their share of criticism, but to place what happened on Sunday at their feet is a stretch of the highest order. And that likely applies to the other popular piñata, quarterback Tony Romo. On this day, Romo's biggest mistake might have been assuming a sack was coming and bailing to the ground a moment before he had to. Otherwise, his throws were strong and on the mark for the entire afternoon. 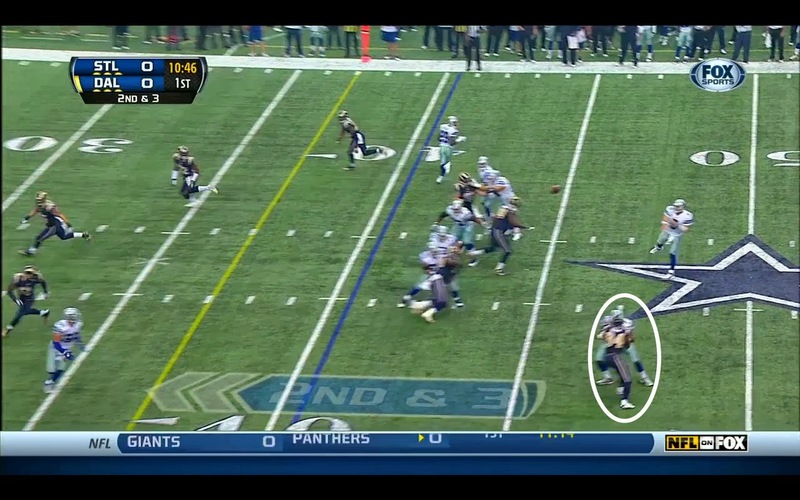 San Diego dared him to beat the coverage, and Romo put the ball in a spot where a catch has to be made. And too often, the ball hit the ground on 3rd Downs. When catchable balls are not secured on 3rd Downs in this league, you lose. It is just that simple. And whether it was Dwayne Harris, Jason Witten, or the unstoppable Dez Bryant, they all took turns allowing balls to hit the ground on catches we have seen them make. All 3 turned into drive stopping moments, and when you only get a few drives because your defense is allowing the Chargers to stay on the field the entire game, well, you understand how the Cowboys took a double-digit lead just before halftime and turned it into a 2-score loss. It was a full demonstration of the team aspect of the sport, and the idea that blame should not be reserved for only the easy targets. Because, in this particular case, sometimes, the easy targets are not the proper targets. In many ways, the game did mirror the Kansas City game of Week 2. In the first half, Tony Romo and Dez Bryant were able to make the opponents' efforts to contain them appear comedic. Bryant dominated a jump ball fade in the end zone and then cut across the field on an equally impressive deep-in route that seemed to place the Cowboys in a spot where they would have questions that the Chargers simply would not be able to answer. But, when that 2nd Bryant score occurred with 2:35 left in the 2nd Quarter, who would have guessed that would be the final time the offense would score a single point on the afternoon? 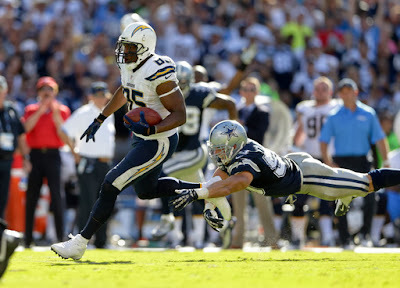 After Jason Hatcher and Sean Lee provided a deflected interception for a score, the Cowboys found themselves with a commanding lead. They now had a cushion to operate with and enough success on offense to believe that this game could be had. But, that is where the plays stopped. The defense could not get off the field the rest of the day. And the offense failed to mount a meaningful drive that did not implode at the end. The combination of both units falling on their face at the key juncture of a tight matchup was impossible to over-come. In Kansas City, the defense held tight for most of the game and tried to keep the offense afloat in the 2nd half. This time, both units were just being defeated with regularity. Defensively, it was a Philip Rivers clinic. 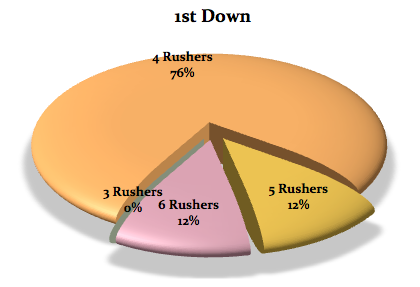 It seemed to be a formula of simply asking the Cowboys to defend the whole field. Short gains were accepted and any time the Cowboys thought they had someone to run with Danny Woodhead, the Chargers were happy to watch the speedy match-up run right by Bruce Carter. Then, as Carter was taken off the field for Ernie Sims, they moved over to a man-to-man matchup of Sean Lee trying to run with Antonio Gates. Gates, of course, ran past Lee and 56 yards into the end zone for a fantastic job of offensive strategy. It was, quite simply, to find the match-ups that most appealed to the Chargers game plan (Woodhead-Carter, Gates-Lee, the shallow zones underneath Morris Claiborne, the deep zones over the LBs and in front of the very deep safeties) and expose it repeatedly. It can only be exposed if it is recognized and then executed, and the Chargers hit on enough of those to reap the points that your preparations all week set up. And that should start to alert us in a disconcerting way. It seemed that much of the rhetoric about the scheme change defensively was based around the idea of building a defense that best showcased the ability of the two young linebackers, Sean Lee and Bruce Carter. The idea, as you may recall, was to show that they could duplicate the Lance Briggs/Brian Urlacher partnership in Chicago or the Shelton Quarles/Derrick Brooks duo in Tampa Bay. Instead, through one month of the season, we have seen several occasions where the opponents are seeming to target those two in coverage. Sometimes in zone, and sometimes in man to man, it sure seems that the middle is a high-traffic place where the QBs know they can accomplish some things against Dallas. We should absolutely expect an adjustment period and growing pains, but this presents us with a few things we did know when this was announced back in January. 1) That the Cowboys were trying to run a scheme that some people think went out of style in the last decade because teams learned how to attack it and find favorable match-ups all day long. The simple cliche that you might here is that NFL offenses are simply too good to not flood the middle of the field and attack the attackers. And 2) That the Cowboys were trying to run a defense that relied heavily on a duo of safeties, despite not having that as a position of strength. This leads me back to something I was told at camp by a scout, "the last thing you need to worry about is Lee and Carter. They will be fine." And I am sure they will be, but after seeing Eli Manning, Alex Smith, and now Philip Rivers repeatedly find a way to isolate Carter and Lee to a point where Carter is being taken off the field so the pain stops, you can understand the trepidation before Peyton Manning comes to town. Then, back to the offense where they were only going to get a few chances to regain control of the afternoon in the 2nd half. After the Woodhead wheel-route TD, it was Dallas 21, San Diego 20 and the Cowboys took the ball for the first time in 44 minutes of real time and 23 straight plays from scrimmage for the Chargers. I don't know if the long layoff caused Dez Bryant to drop a 3rd and 11 play that was thrown into his hands on the sideline, but a catch there puts the team near FG range. He can make that catch in his sleep, but on this occasion, he didn't and the drive ended. The Chargers then began the 4th Quarter with another drive that stalled at the 7 yard line, but took the lead on a chip-shot field goal and were up 23-21. This required another drive from the Cowboys and a real chance for them to lose patience with their play-calling. Yet, on this occasion, they didn't. They stayed "under center" and balanced and moved the ball out to midfield with a series involving Murray and Bryant. But, the drive-killer occurred when Ron Leary pulled down Corey Liuget from behind and a gainer to Cole Beasley was negated and required a 3rd and 8 from the Chargers 44 to keep the drive going. On this occasion, the Chargers locked Eric Weddle up on a seam route with Jason Witten, and Witten had the advantage as the two battled for a lofted pass that appeared to hit Witten right in the 8 on his chest. It was a very difficult play, but one that Witten has made dozens of times. But on this occasion, he didn't and another drive ended. A few minutes later, the Chargers found their Hall of Fame tight end in a 1-on-1 seam route as well, but the play was executed by Rivers and Gates to perfection and all Sean Lee could do is a desperation dive in the end. He missed and the Touchdown put the Chargers now up 30-21. One side made a play and the other side came close, but didn't. The story of the afternoon. The Cowboys kept battling, including a 3rd and 8 conversion when Romo just tucked and ran for the 1st Down inside the Chargers 10, but 2 plays later, rookie Terrance Williams caught a shallow cross and tried to hold the ball out over the goal-line in a very reckless and naive fashion, was hit, and the ball rolled to a Chargers defender in the end-zone ending the afternoon for Dallas. It was a play he could have and should have made, but on this occasion, he didn't and another drive ended. Sure, there are moments where you can 2nd guess the coach (the long FG try comes to mind), moments where Romo might have put a better pass out there (although he played one of his better games with quality throws all day), and issues that do go all the way to the top with Jerry Jones (as always), but to arrive at a conclusion other than placing this one on many reliable members of the roster would be stretching the truth. Bryant, Witten, Lee, Carter, Ware (let's not forget a horrid offsides) and the entire gang share in this loss, which brings the narratives back about .500 football and updates the statistics of 285 games (regular season and playoffs) since Super Bowl 30 when Aikman and company won their last Super Bowl. The win-loss tally since that day in Tempe? 142-143. They are a team that has many positive attributes, but it is days like this that retard that growth and self-belief about what the potential of this team truly is. And what put them here? In some ways, the inability to make the plays that they are capable of making when it matters most. The Cowboys had a wonderful chance to shake their critics and show that the 2013 version is different than those teams that secured this reputation. Unfortunately, for them, they did the same thing they did in Kansas City earlier in the month. They had their moments, but overall, failed to execute at a level that puts wins away against beatable opponents. Next, they can hear all week how they have no chance to beat Denver at home. In some ways, it might be just the type of week that might be perfect for them. But, at some point, talk and hype are worthless. There will be a moment or five during the game where they can either make that play or not. Yesterday, they didn't make the plays that they had to make. And for that, they got what they deserved. Weekly Pod for 1/12/13 - Episode #193 - Monte Kiffin hired as Cowboys defensive coordinator, Best Funeral Ever reviews, JFF crushes it in the Cotton Bowl, Big Game Brent, Friday Game Show. Late every week we pick a few plays or a particular matchup and just break it down from a perspective of watching film and making observations. It is not full of statistical evidence - that is more for Tuesday or Wednesday. It is purely observational commentary based on looking at the coach's film one final time before we put last week's game to bed and move on to the next opponent for the weekend. 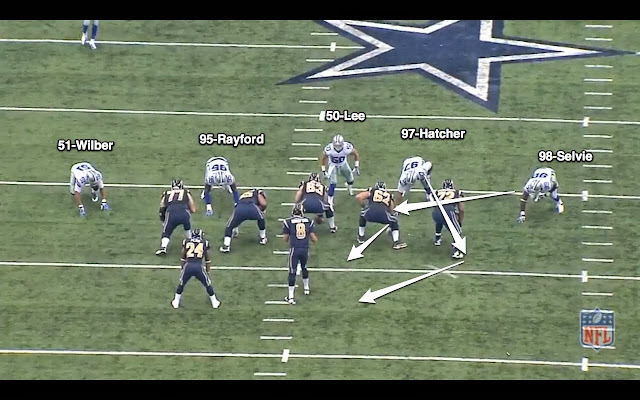 This week, I planned on doing a breakdown of Tyron Smith as we have done a few times before. If you were to do a valuation of each and every Cowboys player based on all factors, it is highly possible that Tyron represents your single most valuable asset in the organization. I know that might be scoff-worthy to some, but a 3rd year player who is 22 years old and still on his rookie deal, needs very little help to accomplish his goals each week, and seems like he is almost a no-maintainence player at a premium position, well, it is tough to beat that. I remember the 2011 draft as one where I locked in one player back in February and never looked back. He had an amazing resume that included fantastic athleticism (quick feet, good balance) with absurd build (height, weight, and arm length all off the charts) and had the physique of a tight end who would never make you wish he looked like he was in better shape. He started like you might expect a rookie tackle to start back in 2011, with uneven performances for sure (and two very shaky performances - both against Philadelphia and Jason Babin), but you saw the talent. He then swung over to left tackle in 2012 and after conceding 8 sacks in 2011, reduced it to a mere 3 in 2012. His penalties were too high, and he certainly had days where the pass rush gauntlet that a left tackle must face was troubling, but overall, he was clearly the only legitimate part of the offensive line in 2011 and 2012 that you could feel great about. He becomes a free agent at the age of 24 after the 2014 season, when the Cowboys will need to figure out a way to keep Dez Bryant and Smith - two guys who will likely get huge deals by league-wide standards - in the same offseason. I expect that they are excited to have players like those two and Sean Lee that they actually want to keep - regardless of cost - because they have achieved everything that they were tabbed to out of college (apologies to Felix Jones, Mike Jenkins, Martellus Bennett). But, it will come at a significant cost and one that will test the Cowboys payroll limits. Regardless, I wanted to do this breakdown of Smith's showdown with the player who was selected just a few picks later in 2011, pass rush stud Robert Quinn out of North Carolina. In Quinn's first year as a starter last year, he totaled 10.5 sacks and already had 4 through 2 weeks in 2013. That demonstrates a career total of 19.5 sacks in just 18 starts, so he knows how to get to the QB. Granted, Tyron will have to face quality every week in this league (Dwight Freeney is this Sunday), but I thought this was a particularly tasty matchup inside the game going in, so I watched the game a few times from simply that matchup's perspective. Honestly, the game presented a report on Tyron that should please anyone that wants him to become elite. He put on a show against Quinn that indicated that he is just that. Quinn is impressive, make no mistake. And he had a few moments of demonstrating that he can get an edge (the inside one) on Smith from time to time. His play-side run blocking generally great. His back-side run blocking is awkward, but usually effective - I am guessing a giant man will never look fluid in cut-blocking a back-side defender - and he gets passing grades all around. But, most of what we saw in this matchup, including the picture below, was Tyron basically shutting down the hottest pass rusher through 2 weeks in the entire NFL. Granted, those sample sizes are small, but ask Levi Brown or Sam Baker about their "Robert Quinn experiences" this season, and they are likely to burst into tears. It was ugly. But, here you see Tyron in his familiar spot. On an island. No help in sight. And no help asked or required. He is perfectly squared up and centered on his man and has forced him so wide that Quinn is closer to his sideline than he is to Tony Romo. This happened numerous times. Romo was getting the ball out quick, which is part of the scheme of self-preservation, too, but Smith had it handled. When doing a film study, I understand that it is pretty boring to simply say that a tackle dominated one of the best pass rushers in the league. From just about any perspective, sacks are interesting and doing a great job of pass protection is not. Good pass protection simply allows your QB to perhaps find a good play, but the LT is only noticed when penalties or sacks happen. To put it another way, in 60 plays, if a defensive end gets 2 sacks or tackles for loss, we consider him for player of the game. But, that means the left tackle was successful on 96.6% of the time. Hardly seems like a horrible day at the office, but in football, that is what the sport demands of its big guys up front. Tyron is so much better than he used to be in many departments. If you watch him closely, you see that on occasion, he can still be bull-rushed. But, his recovery is better than it used to be for me. This here is one example of being pushed back further than you would like, but he regains his form and Murray is able to avoid the issue and go on a long run. Again, you would love to say he can never be moved, but the opponent is talented, too. But, to recover is great. His arms are so long that there is almost no way to beat Tyron Smith around the corner anymore. He is quick to the edge, but when his feet betray him against some of the track stars who now play edge rush positions, he can reach his arm out and steer them beyond Romo. It is a beautiful thing to see, basically because of his skill set of arms and feet. He appears to have an elite career ahead of him for years. Below, see how they did get their one QB hurry. Without knowing the actual protection call, I am merely speculating based on Tyron's technique. But, it sure looks like he is expecting inside help from Murray. I hesitate to say this with any authority because 1) I really don't know and 2) he got help with a chip only 1 other time the entire game. So, the odds are that he wasn't getting help and perhaps set outside on Quinn and guessed wrong. But, again, he looks like he is expecting help, so I will show you this near-sack (that is the best of Quinn's night) and leave it at that. Clearly, Tyron looks less than elite in this moment, and Romo bails him out with his under-rated skills to spin back to his left. Here is one other idea the Rams tried. They actually started Quinn outside in his "Wide 9" and then had him drop with Dunbar on a pass route. This would give Wil Witherspoon a huge chance at getting home because Ron Leary is almost never turning outside to help, but rather always turning to Frederick's side. I can't stress enough how little help Tyron gets from anyone - which is the greatest compliment ever. They leave him happily on an island. So, look above at the pre-snap and then below at how Tyron has to recover at the last second after he figures out the plan here. You cannot imagine how difficult this is to set up on a DE to your wide left and then have the ability to recover and get a piece of a blitzing linebacker. 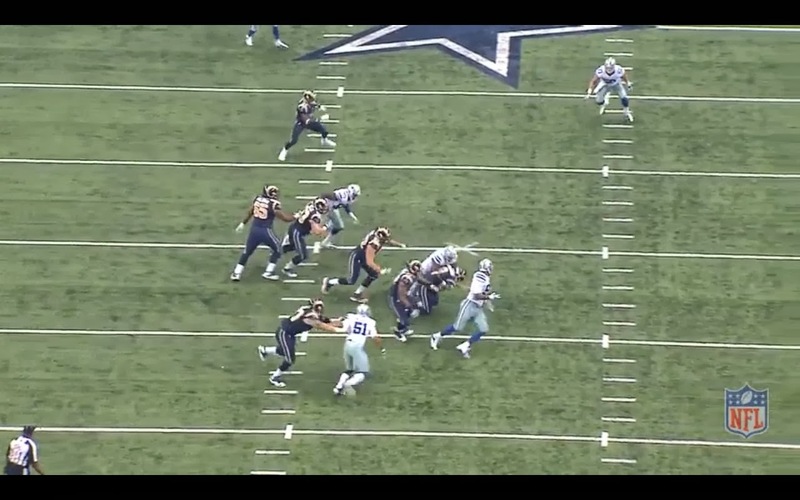 Romo did hurry his throw, but this is the normal dead sprint run at your QB that can knock him out for 4-6 weeks. And then, one more poor play to work out which seems to be more of Tyron leaving too early and not giving Quinn enough credit for his absurd athleticism. On the play below, which is a delay draw, the play calls for the tackles to almost encourage the DE's up the field and then let them go and head to the 2nd level. The idea is that the run up the field is what takes the DE out of the play, but Tyron let him go too early, and the timing of the play put Quinn on Murray's lap and that caused a collision that could have easily been a turnover. They recovered their own fumble, but I am sure Tyron got jumped for leaving too early. If he engages Quinn for another tenth of a second, the play has a chance (except that Leary is beaten pretty badly here, too. Additionally, there was a holding call on a play with off-setting penalties and a play late in the game where Tyron might have dropped his guard momentarily because of the score being out of hand. On that final slip-up, Quinn was able to score a big tackle for a loss. In total, I think it must be said that Tyron got out of this game with a very good review. Understand, context here. I realize Pro Football Focus is gaining headlines this week locally for their love of Doug Free's performance in this early season. I get that, but he is receiving plenty of help at times and he is not going against the level of pass rusher that Tyron is every week. A grade is not an apples to apples comparison and that is why I encourage people to dig deeper than reading that Free was given a 5.4 versus Smith getting a -1.1. Unless you can tell me how that affects my game plan (like leaving him all alone against the leading sacker in the NFL all day) then I am not sure how to quantify those results. Free is playing fine, but he is not in this neighborhood. Nowhere close, actually. Smith is playing a fantastic left tackle while not receiving any help to handle leading pass rushers. I cannot stress what an advantage that this gives your offense to use a numbers advantage in a different place. Breaking down this game and seeing what a force he is in both the run and protection games has me very encouraged about the path Smith is on. Dwight Freeney is next and every week he will see the best pass rushers the league has to offer. 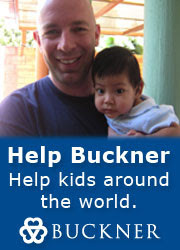 But, he is handling just about every one of them at this point of his young and promising career. I guess the overall point is to watch the game yourself. Especially the media types who take these newly found grade numbers from well-meaning websites and then tell the audience that this demonstrates that Free is playing better than Smith. I am pretty sure that anyone on the Cowboys coaching staff was thrilled that Tyron was on an island and handling his business just fine on Sunday. I’ve always taken issue with the use of the phrase “take what the defense gives you.” Certainly there are times when it is more applicable than others, but it implies a reactive posture that does not accurately capture the nature of playing “offense.” Instead, I prefer the idea of “taking what you make the defense give you.” Often, the mere presence of your biggest known threat is enough to force the strategic hand of the defense into their initial counter. This sets things in motion, prompting a smart offense to now take what is theirs. Such was the case in Week 3 for the Cowboys. This was a marked change from Week 2, when Dallas allowed Kansas City to cover Dez Bryant without safety help far too often despite displaying for them early that was a failed plan. The Chiefs dared Dallas to beat their one-on-one coverage early, and when they did, they doubled down and dared them to keep doing it. Dallas relented, and lost control of any semblance of flow on offense. This week, the Rams made it clear from the start that they wanted no part of Bryant singled up in between the twenties. St. Louis has a potentially dominant front four, but their secondary is mostly inexperienced and only marginally talented. Janoris Jenkins may end up a stud, but it appears Cortland Finnegan is slipping. 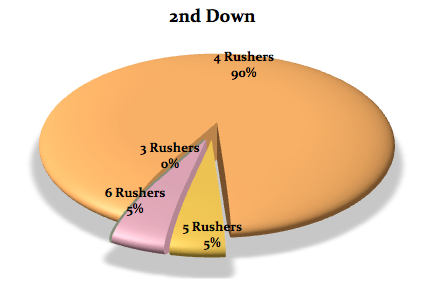 The charts below indicate that Jeff Fisher is well aware of this fact. Last week, Kansas City provided no safety help on 45% of the routes Bryant ran. 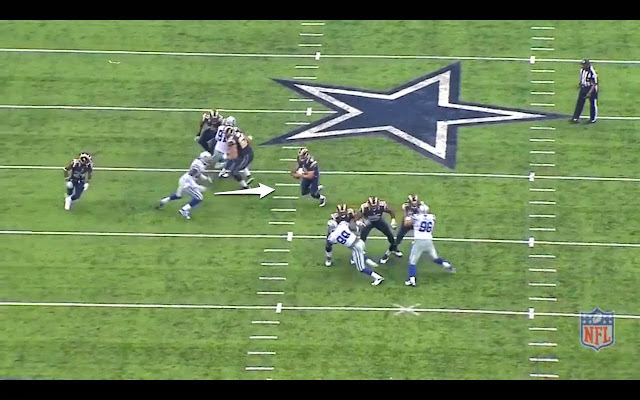 This allowed their already stout front seven to load up the box and shut down a Dallas ground game that needs all the help it can get. 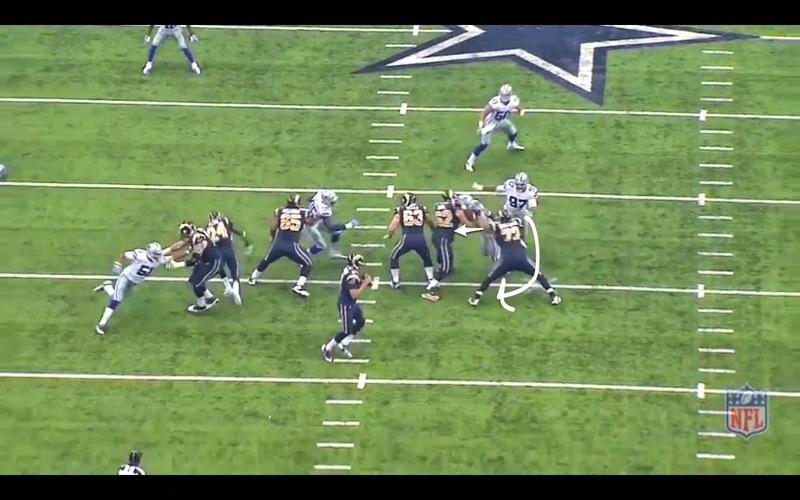 By contrast, the Rams elected to give the corner covering Dez safety help on 79% of the routes he ran. 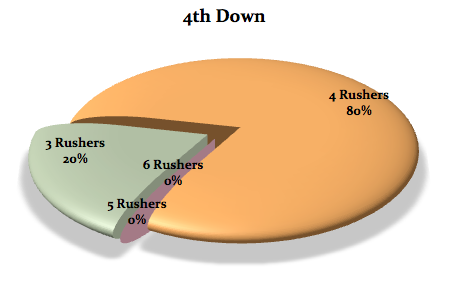 The performance of the Cowboys O-Line should not be overlooked in this game, but I think this shift in coverage is the primary reason Dallas was able to run the ball so effectively (other than the Kansas City defense probably being a little bit better than the unit from St. Louis). As we discussed last week, a straight fade into 2-man or cover 2 is a very low percentage play. One of the concerning notes from last week was Dallas’ inability to vary the alignments and routes of Dez when a safety was present. This week, however, the Cowboys dialed up four digs and four square-ins, designed to get the weakness of a 2-safety look. 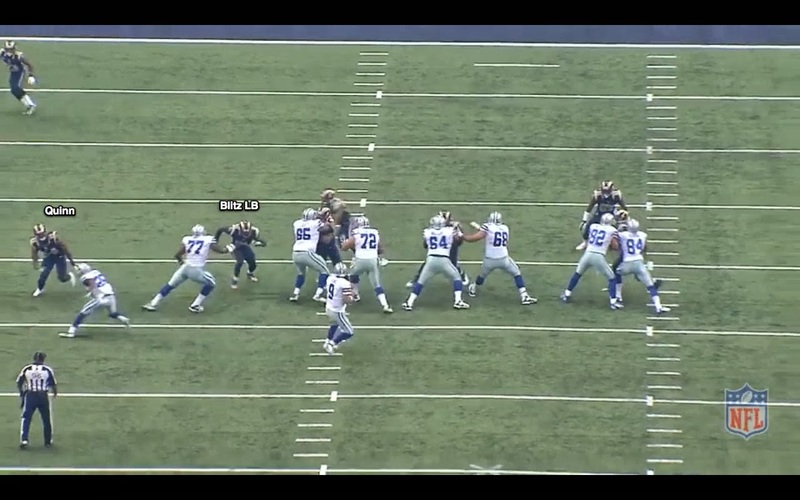 Romo targeted Dez on three of these types of routes, completing two for 25 yards. It is likely that the brash approach of Kansas City last week will be the anomaly, not the norm, so 2-safety shells will probably be commonplace for Dez. If Dallas plans to still attempt to get Dez involved against these coverages, these routes will have to be reliable options. Callahan actually called three plays in one drive that involved Bryant running a square-in, which gives us a chance to check out some of the different concepts Dallas will use in conjunction with this route. 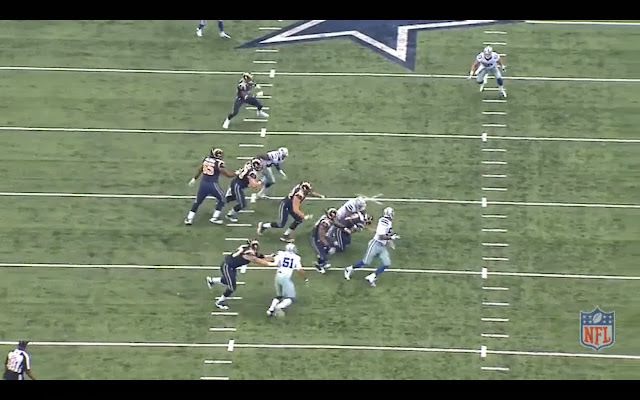 Here we see Bryant lined up at the bottom of the screen with Miles Austin in the slot next to him. This is a basic levels concept, with Austin running the dig at 12 and Bryant running the square-in at 6. Bryant presses the outside shoulder of Janoris Jenkins, who clearly respects him as a deep threat (despite seeing no deep targets in this game) even with safety help behind him. Dez gets to the top of his route and then drives away from Jenkns off of a hard plant. 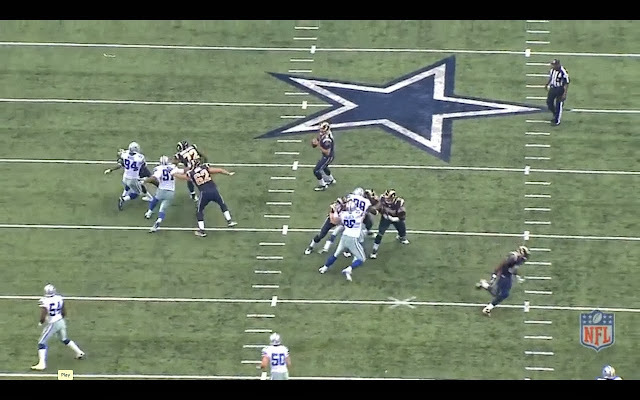 Austin is covered by Finnegan who carries him seven yards before looking back at Romo. This leaves a sizable hole for Bryant to throttle down into and make the catch. He fights an overmatched Finnegan for a few extra yards and a first down. This is a great example of how Dallas can use Bryant's skill set to move the chains even when a defense commits defenders to limiting his impact. On the next play, we have Dez on the bottom of our screen with Witten tight left. Save for the difference in formation and alignment, this is the same play. Witten runs the dig while Dez runs the square-in underneath. It's a shame this play couldn't have been protected better because the Rams D, again, didn't do a very good job of defending the Hi-Lo. 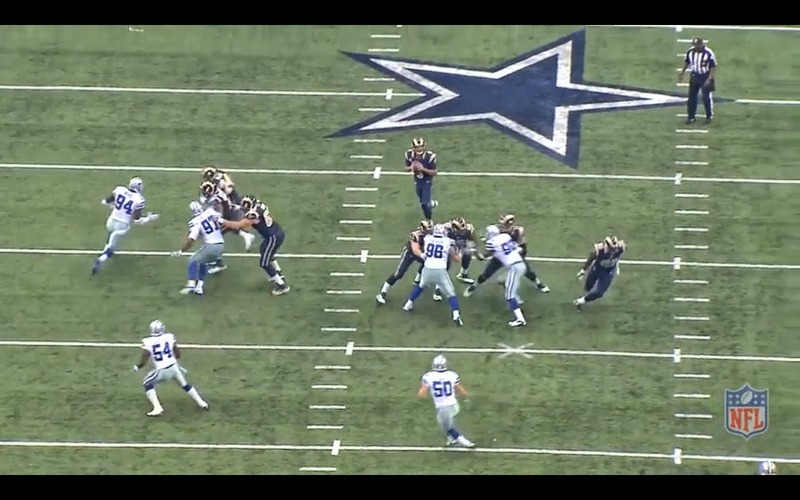 It looked like Romo very briefly had a lane to hit Bryant. Alec Ogletree is covering Witten, but he never really takes his eyes off of Bryant. 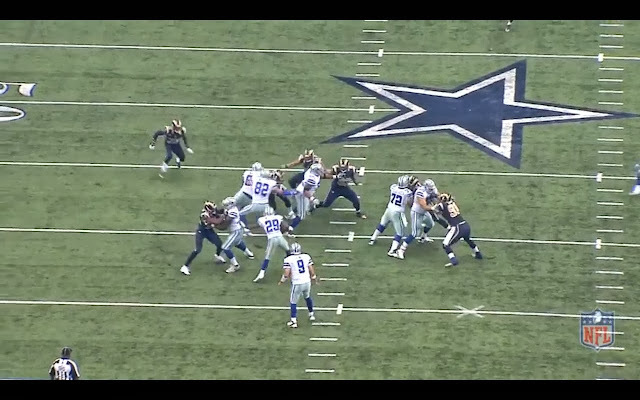 This means he leaves Witten a little bit early, leaving him open with the safety seven yards away. However, this was one of the few times all game Romo has pressure in his face, and he took the sack. Regardless of the result, this play illustrates what happens when teams are worried about Bryant underneath. After the sack and a stuffed run play, the Cowboys face a 3rd and long. 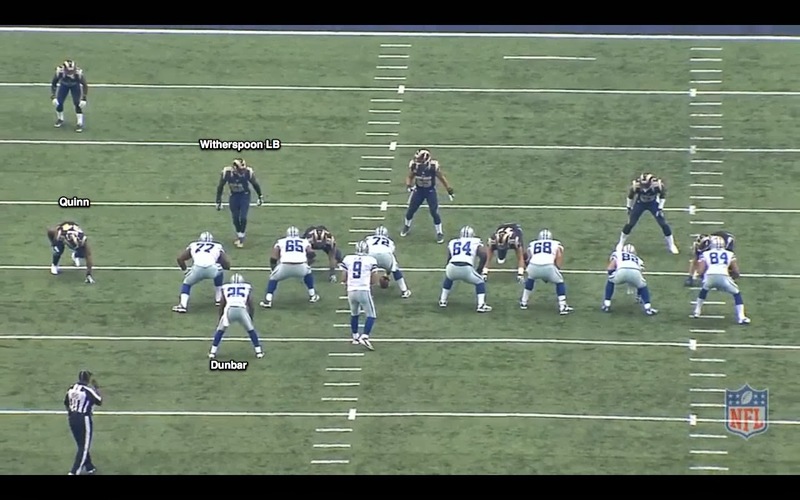 We see the same formation, and the same route from Dez on the bottom of our screen. Again, we see that Ogletree is watching Brant from the snap, and he collapses down on him as soon as Dez makes his break. 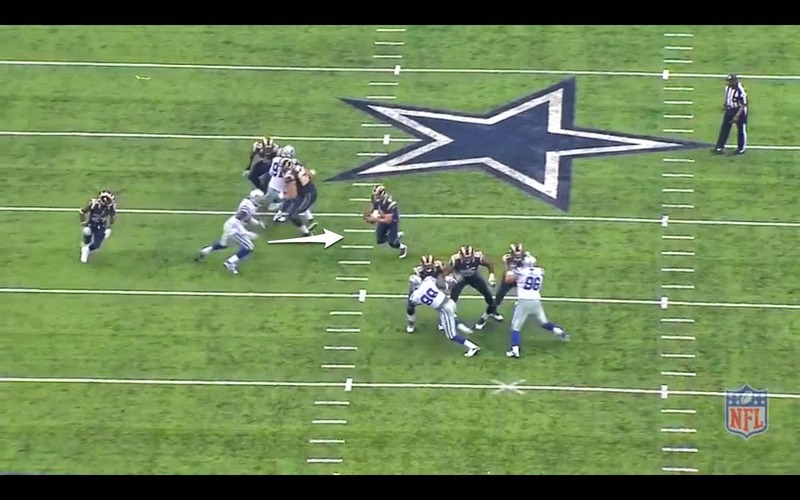 He turns Witten loose very quickly, allowing an easy hot completion. This may have something to do with the down and distance, but it still demonstrates that Dez can be used to alter the spacing of a defense when running shorter routes as well. Coming into the season, it was my opinion that the only way this Dallas offense would reach its potential was with more deep targets and red zone targets for Bryant. Although the Cowboys did not target Bryant on any deep balls this week (an element of their offense that I would like to see a more consistent commitment to), the game on the field made this understandable. The looks those deep threats generate were already being given. However, Garrett/Callahan did find it in their heart to give Dez one target inside the 20, which he scored on. That’s Bryant’s fourth red zone target in 11 trips this season. Last year, he was targeted 14 times in 50 trips. Think about that. They ran 123 plays in the red zone last year, and felt it appropriate to target Bryant on just 11 percent of those snaps. So early returns on Dez’s red zone usage are relatively promising, but the fact is he is their best option near the goal line and the number should reflect that. The Rams defense was committed to taking Bryant out of this game, and the Cowboys offense did a good job of exploiting the softness that commitment created. They did this while also getting the ball in Bryant's hands a few time by varying his routes and allowing him to use his physicality in the red zone. The Chargers do not have anyone who can even publicly speak about the prospects of covering Dez without help, so I expect to see much of the same this week in San Diego. What will Dallas do with what they make the defense give them? About once every 2 years, the Cowboys have a day where they get to the QB for 6 sacks. It is a rarity to apply this much pressure, so you can certainly see why the entire city is not currently in depression over the news that Anthony Spencer has possibly played his last game in Dallas due to recurring knee issues and will now undergo season-ending and career-threatening surgery. Spencer was the leader in 2012 in splash plays for this defense and is an exceptionally under-appreciated Cowboys defender, but in this league, to have success, you must truly be a "next man up" type of squad. They can't worry about who isn't here. They have to worry about those they have available who can alter the outcome of this next game and this next QB. The NFL doesn't cry over spilled milk. It can't be undone. So, let's focus on how the Cowboys found 6 sacks without blitzing on 5 of them. The most unlikely preseason chatter that I repeatedly swatted down was the idea that the Cowboys would be able to "get there with 4", and apply pressure without blitzing - which is what gets them in trouble because it exposes the secondary to huge plays. But, on Sunday, we saw the Rod Marinelli/Monte Kiffin calling cards to getting there with 4. We saw explosive rushes from the snap and winning matchups as this group is barely recognizable. They are playing a whole new style that is most exciting if it can last. And in there, we see many of the rush-games that those Tampa and Chicago defenses were known for. The twists and slants, the continuous stunts that are designed to cause confusion and to present favorable and winnable match-ups are being unleashed and executed nicely. Let's look at 2 stunts that led to sacks on Sunday. The idea here is for Selvie to go first, and to slant in and hit the guard - 62-Harvey Dahl on his outside shoulder to knock him off the 3-technique, Jason Hatcher. 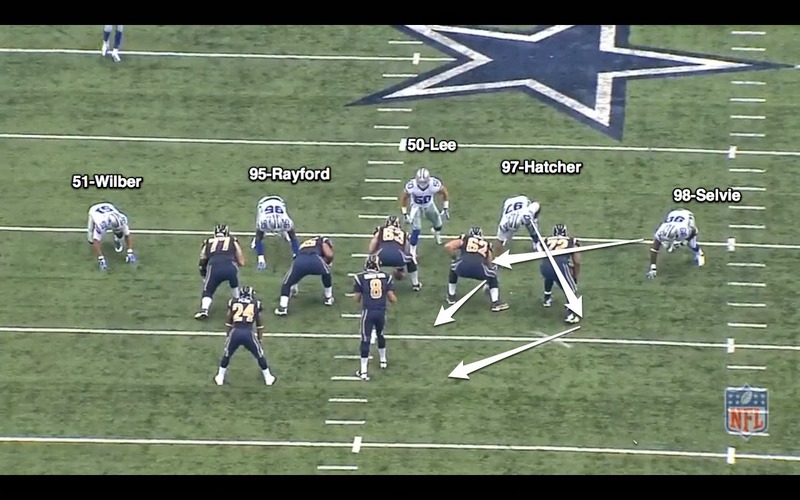 Hatcher then should be able to get around the RT-72-Joe Barksdale as big Joe will be trying to recover on Selvie, thus going to his left while Hatcher will be crossing his face to the right. 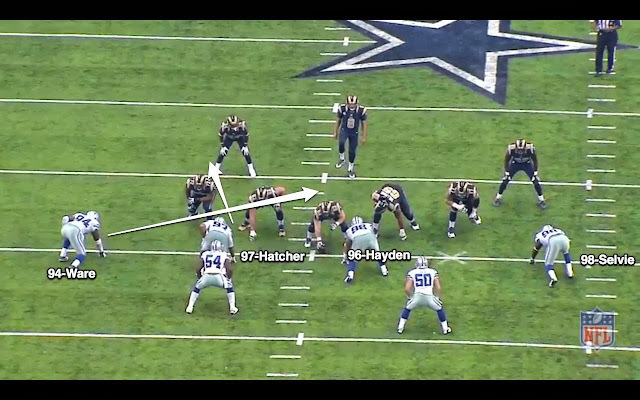 This is the off-balance result that you look for in pass-rushing, and should give Hatcher outside leverage to the QB. In frame #2, you can see that Selvie now has Dahl swung around and facing the sideline. Hatcher can see how spread out Barksdale's legs are and this is working quite well. Scott Wells, #63, is looking at Rayford and figuring he needs to help out his LG - 65-Chris Williams, and is unaware that Dahl is almost on top of him. Selvie demonstrates his fork-lift power as he has now pushed Dahl into Wells and even though he was supposed to sacrifice himself to free up Hatcher, he did it so well that Selvie now sees that he has his own angle to getting to Bradford. Keep in mind, this is happening very quickly, even though it might not seem that way when you look frame by frame. Selvie overpowers Dahl, and with Hatcher sealing any escape route for Bradford to his right, Selvie has his sack before his RB can even provide a safety valve. Quick, powerful, and a player carries out his assignment so well that he was rewarded with a free path to the QB. Again here, Dallas is rushing just 4, and St Louis has 3 against 2 with Dahl, Barksdale, and the RB to account for Ware and Hatcher. You can believe that the RB is planning on an outside chip on Ware to help out his RT. So, the Cowboys know that if Hatcher can get to the tackle on the stunt, then Ware can cut back inside and run through Harvey Dahl. In case you are picking up on the pattern here, it is clear that the Rams' RG was the target of both of these stunts. An attacking defense figures out your weakness and then makes you fix it or to be destroyed. Look at Hatcher just setting the pick here. 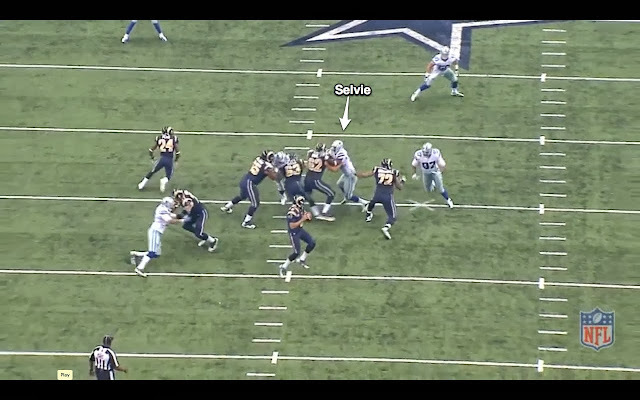 He heads right for the inside shoulder of Barksdale (the man responsible for Ware). 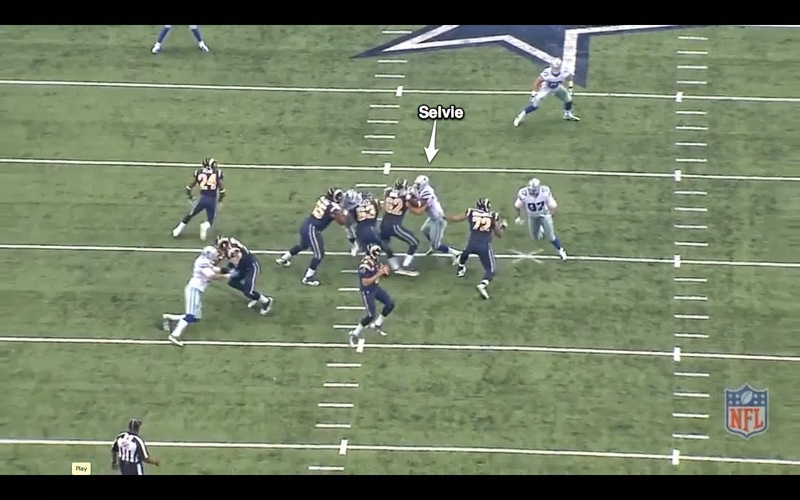 Ware helps the leverage here, by taking 2 giant strides to the outside path. 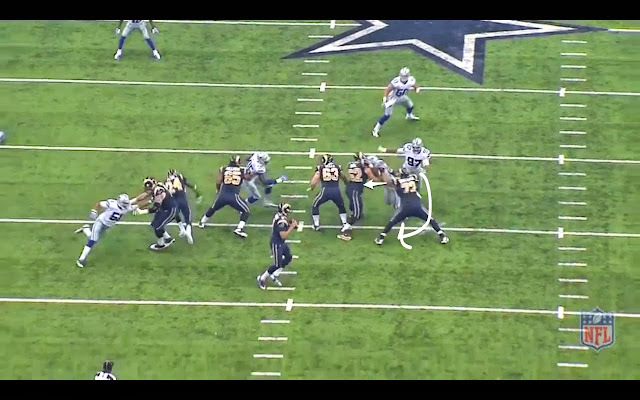 This occupies the RB who is preparing to chip Ware back inside. But, Ware has no intention of actually rushing outside. He is just giving Hatcher time to set up his pick. As you can see, Hatcher is now in position. 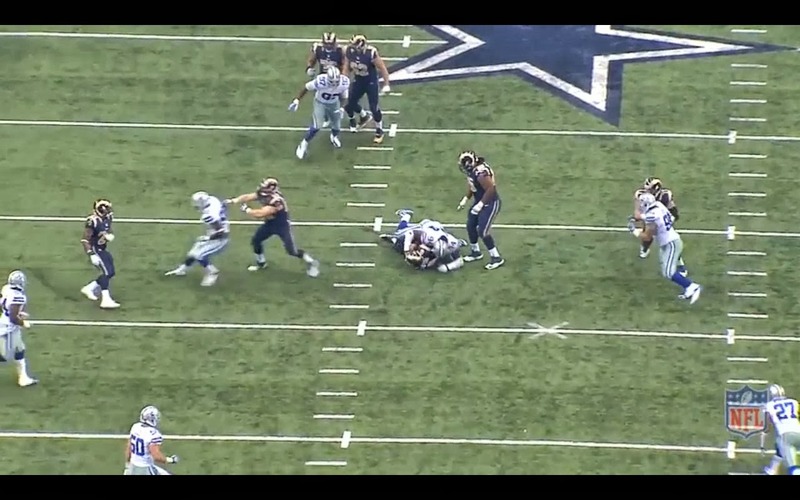 Ware is slamming on the brakes here, and Hatcher is getting to Barksdale. 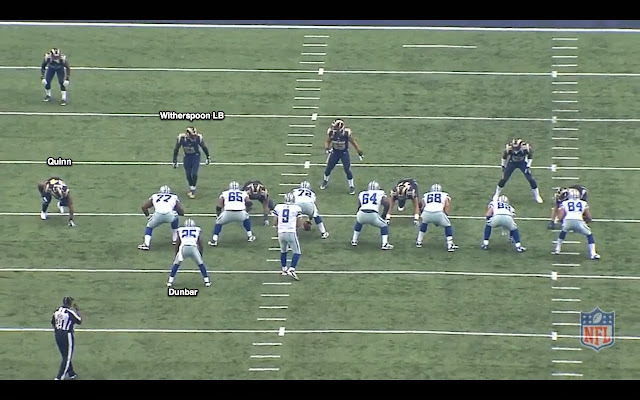 All the while, Bradford is waiting for something appealing, but keep in mind that the Cowboys have 7 in coverage against just 4 Rams since they are using 6 to block 4. Look at Dahl again. He has no idea that he is going to have to switch to Ware. Dahl is actually facing his own end-zone. He has no chance once Ware plants his foot. The blur is DeMarcus Ware. Dahl can see him, but he can't even touch him. Hatcher has pulled it off by taking everyone with him, leaving the Cowboys all-time sack leader to pass Harvey Martin and set his record by devouring Bradford with great ease. In honor of Ware breaking the record, I figured I would make today's gif to show his best technique. It is the bull-rush that Jake Long obviously wasn't ready for. That makes Reggie White proud as Long goes flying through the air. In our weekly splash play study, I found 19 this week against the Rams. That is a very high number, but I think it fairly represents the number of big plays the defense was generating. And now, the 3 game 2013 totals - I think the work of George Selvie has been noted all 3 weeks, but let's make sure that Barry Church is getting the recognition he is earning. I think he keeps getting better and better. 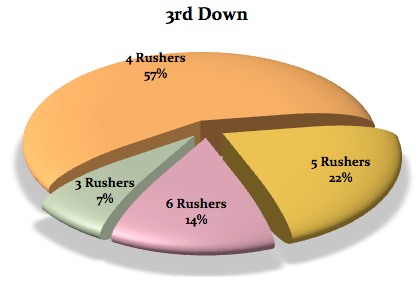 Here, we look at the big plays for (Explosives are plays 20 yards and longer) and the big plays against each week (Sacks and Interceptions) and see what role (if any) was played by the defensive coordinator. Anytime you can get out of a game with just 2 explosive plays against - and one of them ended with Justin Durant stripping the ball away and Sean Lee recovering for a takeaway, you would definitely say you had a wonderful day at the office. Look at this! 6 sacks and you got there with 4 on 5 of them. That is really impressive work which leads back to the ability to "get there with 4". Ware and Hatcher seem to be threats to beat their guy on any play, and now they have active bodies joining them. Losing Spencer is certainly going to be felt, but you have to be excited about the 3-4 active, young bodies that have been acquired with Marinelli/Kiffin's watchful eyes and templates for what they look for in defensive line play. With each passing week, they are gathering a group that wasn't even in Oxnard with the team. They keep churning the roster to find their group that fits their ideas. 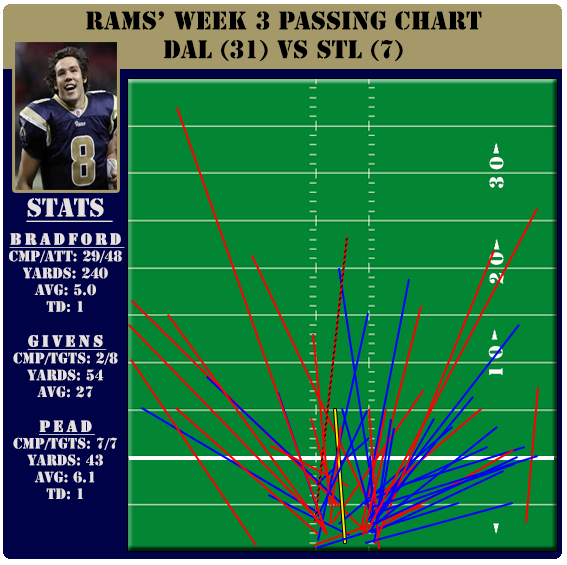 One comment I wanted to make on Tim's passing chart that he made for Bradford's performance. I think all of the red on the long throws demonstrates that Bradford needs to improve his deeper accuracy. I realize there were a couple drops, but if you go back and watch the game, you see that he had some opportunities down the field and failed to make a proper, accurate throw to take advantage. He sailed quite a few receivers and that led to his dismal performance as well. It is very possible he was hearing footsteps after all of the early pressure. This is very exciting to look at from my perspective as you are watching the Cowboys apply pressure throughout the game, but when you total up the number of blitzes that Monte Kiffin is using, you see it is just 11 of 57 situations. That number falls at 19% and proves that although they are causing their fair share of chaos, it is also being done soundly and without making unwise decisions about pass coverage. Put another way, Rob Ryan's defense blitzed 24% of the time in 2012, and still didn't generate enough pressure on the passer to be effective. I know it is early, but if you can blitz less but get to the QB more? Well, perhaps the Cowboys do have a couple very smart men coordinating their defense these days. The 16 games will reveal the truth, so we cannot get carried away about how it might work against a Giants squad that has no rhythm, Alex Smith, and Sam Bradford. Rivers and Manning are warming up in the bullpen. SUMMARY: What more can you say? They won't happen like this very often, but you can only play who is on your schedule. San Diego will present definite match-up issues for this defense and what you did to Sam Bradford will be irrelevant. But, on this day, the Cowboys showed what they are capable of on their day. 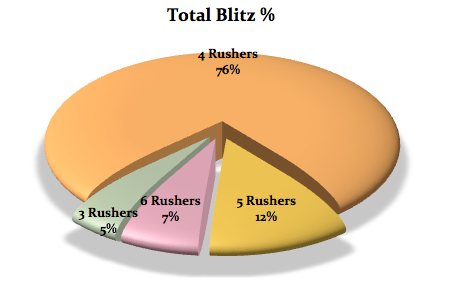 Pass rush without blitzing. I understand if you are amazed. It has been a while around here since we could say that.